The family of American journalist Marie Colvin has filed a lawsuit saying the Syrian government deliberately targeted her in the Homs bombing which killed her four years ago. Her sister Cathleen Colvin, whose children are Marie’s heirs, filed the suit through the non-profit Centre for Justice and Accountability saying Syria had rejected a “reasonable opportunity” to arbitrate the claim. The CJA says their lawsuit is the first case seeking to hold the regime of President Bashar al-Assad responsible for crimes. Marie Colvin, 56, died on February 22, 2012 with French photographer Remi Ochlik when their building was hit with, according to official Syrian sources, an “improvised explosive device filled with nails”. The Syrian government claimed the bomb was planted by “terrorists” but survivors of the attack say the building was deliberately targeted by the Syrian Army. The lawsuit called Colvin one of the great war correspondents and accuses “Syrian government agents” of responsibility for her death. She worked for the Sunday Times for 25 years covering war zones including Sierra Leone, Chechnya, Iraq-Iran, East Timor and Sri Lanka where she lost an eye in a grenade attack. In 2012 Colvin was reporting on the Syrian revolution which started the year before. The Syrian Army launched a massive military operation in Homs, the country’s third largest city, laying siege to rebel-held suburbs. Despite a media blackout, Syrian citizen journalists used YouTube, Skype and Facebook to get the truth out to the world. Local poet and activist Khaled Abu Salah and others set up a media centre at a secret location on the ground floor of a three-storey house. They produced video blogs and hosted foreign journalists including Colvin. The Assad regime accused Salah and the Media Centre of being “terrorist collaborators”. In early February 2012 the army had begun a scorched earth campaign against the Baba Amr suburb of Homs, where the studio was located, with civilians subject to artillery and sniper fire. The world was taking note. Colvin had seen the Media Centre’s video footage and was determined to cover the siege. She and other journalists gathered at Beirut Airport where they were smuggled into Syria. She travelled with British photographer Paul Conroy and Syrian translator Wael al-Omar. They decided against an official Syrian visa after French journalist Gilles Jacquier was killed in Homs in January, with journalists believing he had been led into an ambush. Colvin, Conroy and al-Haems made it to Homs using back roads and a 3km-long tunnel. Colvin was there for two days as the neighbourhood took heavy shelling and then returned to the border where she filed her report for the Sunday Times. A day later (February 20) they returned to Homs where they were trapped by artillery fire. Despite her vast wartime experience, she said the situation inside Homs was the worst she had experienced. On February 21 Colvin made an audio satellite broadcast from the Media Centre picked up by CNN, BBC and Channel 4. “There are rockets, shells, tank shells, anti-aircraft being fired in parallel lines into the city,” Colvin said. “The Syrian Army is simply shelling a city of cold, starving civilians.” They bunked in the back room of the house with French and Spanish journalists. The regime knew Colvin and others were coming from Lebanon and tracked their movements to the media centre. The lawsuit said a decision to attack the centre with artillery fire was taken at the highest level by the war cabinet including Assad’s brother Maher al-Assad and was carried out by the military with help from a secret government death squad known as Shabiha (derived from the Arabic word for ghosts). That night the Syrian Army at Homs was tipped off about the location of the media centre and the information was relayed back to Damascus. The information matched the location of Colvin’s intercepted broadcast signal and officials spent the night working out exactly where the journalists were in the compound. The following morning Colvin was preparing to leave through the tunnels when the shriek of a rocket shook the house. Using a method called “bracketing” they launched rockets on either side of the compound, drawing closer with each round. Panicking people inside the centre decided to evacuate. As Colvin and Ochlik rushed to the front foyer a rocket slammed into the ground directly outside, killing them both. Conroy, al-Omar and French journalist Edith Bouvier were severely injured by the shrapnel and debris. Survivors leaving the building were spotted by aerial surveillance. Artillery switched target to the nearby streets and aimed at survivors and emergency responders. There were no armed rebels nearby. After the attack Syrian intelligence gathered at Army offices where they were congratulated on the news Colvin and Ochlik were dead. The others escaped through the tunnel, including Edith Bouvier with a broken leg. Conroy called the situation in Homs “systematic slaughter”. Few believed the Syrian story of terrorists and Colvin’s family began the painstaking search for evidence. This week’s suit states categorically “with premeditation, Syrian officials deliberately killed Marie Colvin by launching a targeted rocket attack”. Whether anyone will ever be brought to justice in a war that has killed almost half a million, remains a moot point. Much of the talk of the federal election has been about the impact of Pauline Hanson and her return to federal parliament after a gap of 18 years. This time she will be occupying the purple benches of the Senate rather than the Green of the House of Reps but she will likely bring back the same unreconstructed firebrand politics to the chamber, and to the nation, with the same national coverage. As always her media coverage exceeds her influence, and one commentator acidly described her as a “wholly owned subsidiary of Channel Seven” (and that was not the worst he called her). The ambiguous relationship she has with media was summed up in an extraordinary outburst today where she complained of bias against her and said she would bypass traditional newspapers and TV networks in favour of citizen journalism. Citizen journalism may be the only kind left in the coming years but if paid media does disappear, Hanson’s cause too will die for lack of publicity. Some commentators like Tim Soutphommasane say that while the politics of Hansonism haven’t changed in two decades, Australian society has moved on. Yet she will be an important voice in the next parliament and as such, worthy of attention. I am no fan of Hanson’s political views however when I was working for the Gatton Star newspaper in 2015 I had the opportunity to cover in close detail her campaign to win the state seat of Lockyer. I ended up with similar feelings and a similar respect for Hanson that journalist and author Margo Kingston had for her after she covered Hanson’s 1998 campaign to win the seat of Blair, a story Kingston recounted in her book “Off the Rails”. I could see, as Kingston could, that Hanson had a great way with people and formed quick bonds with everyone she met on the street. Hanson could always draw on a great inner strength and her sensational jailing and subsequent quashing of her electoral fraud offence in 2003 has only made her stronger. The left wing of Australian politics has always been quick to denounce Hanson for her extremist views, but the reality is that much of her 1996 platform (such as the tightening of the borders, the removal of ATSIC, and the reduction of foreign aid) became mainstream. But even this week when Kingston warns we should listen to her not lampoon her, the reaction from the left has mostly been lampooning of Margo and unbridled rage against Pauline. Hanson seems to feed off the rage of the left. She has an indefatigable appetite for elections, having run in nine of them, though until last week none were successful since that shock 1996 breakthrough. Hanson narrowly lost the 1998 election that Kingston covered, and lost even more narrowly the 2015 election in Lockyer I covered (another 50 votes would have put her in state parliament) but I had to admire her persistence, energy and ambitious nature. I remember getting an angry late night call from her during the campaign after I suggested in an editorial her ultimate aim was to become prime minister. Of course being outside the major parties, Hanson will never become prime minister. But it is clear she can tap into deep wells of resentment and command a lot of votes. Her views on “Islamageddon” and climate change are nonsense (the latter is the influence of conspiracy theorist Malcolm Roberts whom I had the dubious pleasure of listening to during a forum in Gatton organised by Hanson) but the major parties should take her seriously. She represents a strong core of disenfranchised and disillusioned people who believe she is the only one speaking for them. I congratulate her on her election to parliament and hope she finds the wisdom to properly represent the people that voted her in. Bill Shorten speaks on TV tonight. 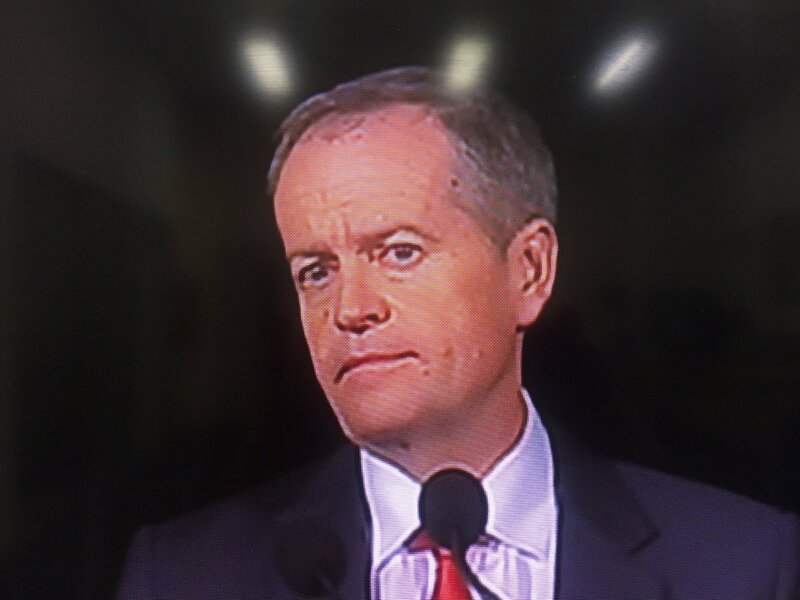 As we pass midnight on election day in Australia, no one is calling the election and Labor’s Bill Shorten has rightfully called it a good day for Labor. Yet he will not become the new prime minister, that honour for now will remain with Malcolm Turnbull. At the moment the ABC reckons the LNP has 73 seats, two short of an overall majority in the 149-seat house. Labor has 66, others have five and there are six in doubt. The Coalition led in most of those doubtful seats last time I looked and traditionally are stronger in postal votes. They can also count on the support of at least one of the independents in Bob Katter. Katter was comfortably re-elected in the seat I live in, Kennedy, which covers a vast swathe of North and North-West Queensland. Katter almost lost the seat to the LNP’s Noeline Ikin in 2013 but Ikin had to withdraw in January due to illness and her replacement, the 25-year-old Jonathan Pavetto did not have the name recognition to defeat his 72-year-old opponent. In the last hung parliament in 2010, Katter went with the Coalition and given his stated distaste for Bill Shorten and Tanya Plibersek (though he has a lot of respect for Anthony Albanese), he should vote for the Coalition again this time. As for the others, Adam Bandt and Andrew Wilkie should support Labor while Cathy McGowan and NXT’s Rebekha Sharkie are likely to vote tactically but unlikely to deny the Coalition the chance to form government. This result is a good thing. I’ve often editorialised to say that despite what the parties say minority government is a good thing and not a recipe for chaos. It forces parties to negotiate to get their agenda through. And that’s without even having seen what the Senate is about to throw up, but with only half a quota needed, that won’t be a Coalition majority either. Nick Xenophon has increased his power. Pauline Hanson too has done well and not just in Queensland, but even she is not the ogre she is painted out to be and will be just one player in a big pond. It has been a somewhat disappointing election for the Greens and their impressive leader Richard Di Natale. They increased their vote by 1.25% but they failed to break through for a second House of Reps seat and are likely to lose a seat or two in the Senate. This is despite their support for the rule changes in the Senate election which most people expected would favour them. But any disappointment they may feel will be dwarfed by the Coalition which has lost at least 12 seats to Labor (while picking back up Clive Palmer’s seat of Fairfax). Prime Minister Turnbull hasn’t spoken yet but this result is a bad personal blow for him and continues his poor form leading campaigns at polls, dating back to the republic referendum in the 1990s. The pressure will be on him to resign but surely they would have been soundly beaten had Tony Abbott remained at the helm. Turnbull will have to remind his own hardheads of that fact and he will have to negotiate with the other parties’ hardheads to get his agenda through. However it is not entirely clear what that agenda is, even after a ludicrously long eight week campaign. Shorten said it was time for the parliament to get back to work, and he is right. But a big question remains after today. How will it work?